I’m working on my 2014 reading list! Since the release of my book Families of Two over a decade ago, I have talked with thousands of childfree people. I have also talked with many others who are in the midst of the parenthood decision, and those who are childless – those who want children but do not have them. The reasons they are childless are many, from infertility to not having a partner to co-parent. Whatever the reason, being childless can bring great pain. 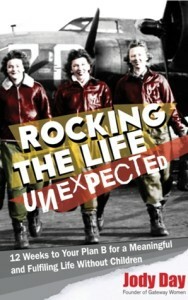 This is where Jody Day’s book, Rockin the Life Unexpected: 12 Weeks to Your Plan B for a Meaningful and Fulfilling Life Without Children, comes in. First I want to say that I am already a big fan of Jody’s. Like I do, she sees how there are a number of ways the childfree can childless can connect. I looked forward to reading her book, which I knew included her personal story of childlessness. Her book tells this story and much more. Her journey also led to her create Gateway Women, culminated in Rockin the Life Unexpected and started her on the road to becoming a psychotherapist. Written in lovely conversational style, you feel like you are sitting with a wise friend who has gone through what you are going through. As a childless reader, it feels like she is gently nudging you towards the next step in your own process. She mixes her experience with insightful exercises at the end of each chapter – that are not to be skipped! 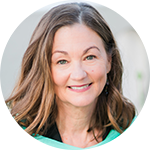 Early on Jody takes us through how accepting childlessness is a special kind of grief, and wisely applies Elisabeth Kubler-Ross’ Grief Model to the childless acceptance process. She guides readers through 12 steps to “involuntary childlessness recovery.” Some relate to things the childfree experience, including “being the odd one out” and how to “liberate oneself from the opinions of others.” Those opinions rest in pronatalist assumptions, like revering biological children, and judgments related to not being able to have your “own” children. The childfree and the childless also share dealing with the myths that without children, we will be lonely and alone when old, and lack a real legacy in life. She goes into why losing the potential identity of mother can be hard to cope with from an ego identity perspective, and gives tools to help the childless reclaim their power and identity – without having motherhood having to be at the center of either. As part of this process, Jody examines how creativity is one of the roots of recovery. Giving birth is a creative act, yes, and is one of the many ways to give birth to something. She gives readers great tools to explore this for themselves. I love how her journey and the process of how she came out the other side of it gave birth to this book! I also applaud how Jody explores why women can be so obsessed with having a child. I go into this in The Baby Matrix from a sociological, cultural and social perspective; Jody comes at it from the inside out. She helps readers put down the “unholy trinity of guilt, shame and blame” and figure out how to live out other dreams” they have to find fulfillment in their lives. The 12 steps inspire rich self-examination to help you define what purpose and meaning mean to you – which is something we all should do whether we end up parents or not.